SB Answer App Review: A Must Have for Swagbucks Members? As the title suggests this SB Answer is an app developed by Swagbucks. 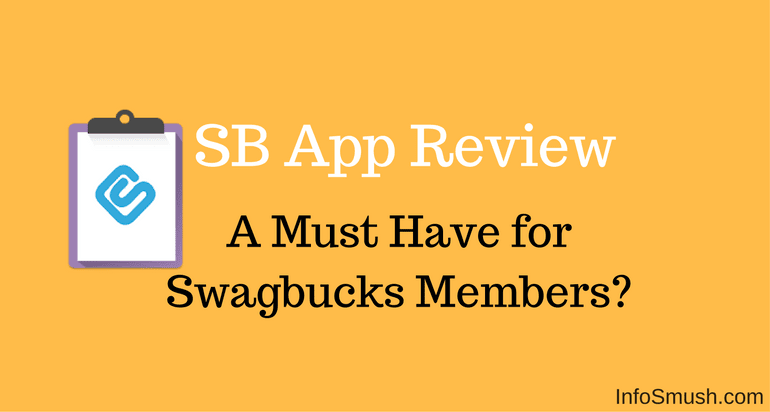 But before beginning this review here's a quick overview of Swagbucks.com: Swagbucks is a rewards program where you can earn points(SB) for completing offers and surveys, watching videos and more. SBs can redeemed for PayPal cash or other gift cards including Amazon, Flipkart, Facebook and eBay. Read my swagbucks review here. Of course. SB Answer is a part of Swagbucks. And Swagbucks is totally legit. I've been paid 3 times by Swagbucks. SB Answer is an developed by Swagbucks for its members. So in order to earn from this app you need to sign up for Swagbucks. Sign up here. Or if you already have an account keep reading this review. On SB Answer you can earn SBs for completing surveys, Daily Polls, etc. and redeem your points directly from within the app. 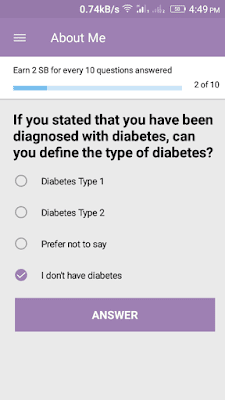 This app is solely developed for providing users a better platform for taking surveys on mobile. Average reward for each survey is 75SBs and take 10-15 minutes to complete. However, some surveys can pay you more than 200SBs. The number of surveys you'll get largely depends on your country. If you are from countries like India, Pakistan, Vietnam you will only receive one survey per week. But if your from countries like USA, UK or Australia you can get 10-50 surveys per day based on your profile details. Everyday you can answer a new Poll and earn 1SB. Daily Polls are Polls on Personal, Political or Social matters. You just have to select your answer from the list and Vote. ! SB will be instantly credited to your account. In the about me section you will be asked questions about yourself. These questions help Swagbucks to provide more and relevant surveys. Don't worry you will be paid for answering these questions. For every 10 questions that you answer 2SB will be instantly deposited in your account. It only takes 1-2 minutes to answer 10 questions because you just need to select your answer from a list of options. You can redeem SBs for PayPal cash, Amazon gift cards, Facebook gift cards, Flipkart vouchers and many more. 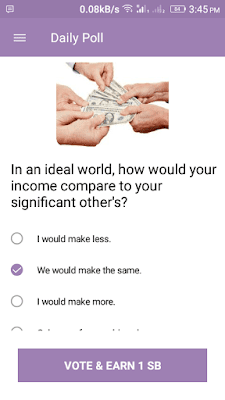 SB Answer is a must have if you are a member Swagbucks or if you are interested in making some extra cash on your Smartphone. You can complete surveys for SBs and redeem it for cash or various gift cards. Share this SB Answer review to let your friends know.